The first full day of 400+ ppm CO2 as recorded at Mauna Loa in Hawaii last week produced an outpouring of sentiment and grief from many, but the news has seemingly passed. Unfortunately, the arrival of such a day had become inevitable. 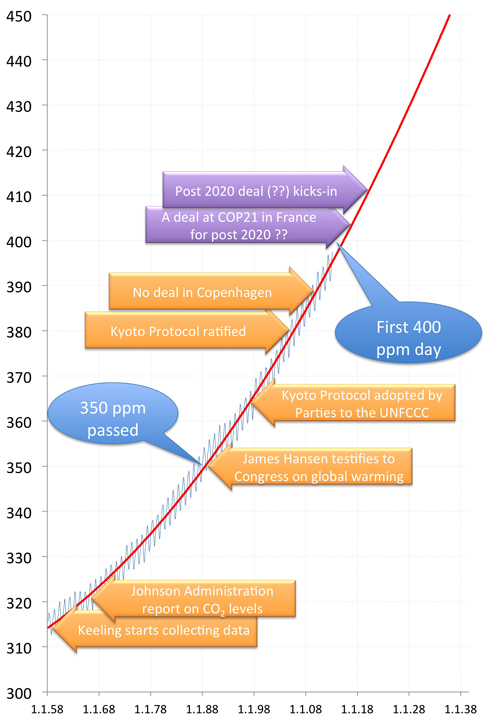 Since the early days of the Keeling Curve at 315 ppm when it became clearly apparent that anthropogenic CO2 emissions were accumulating in the atmosphere, we have counting up the ppm to this day. Despite an early clear warning to the Johnson Administration at 321 ppm, it wasn’t long before there was a brief worry about global cooling. Then, with atmospheric chemistry growing as a discipline (probably on the back of concerns about a cold war nuclear winter), we were distracted at 332 ppm by the first major anthropogenic global concern, the hole in the ozone layer. But with a treaty negotiated and ratification underway by 349 ppm (only 17 ppm to sort that one out), it didn’t take long for the science community to remember that another big issue was lurking in the shadows. The earth is warmer in 1988 than at any time in the history of instrumental measurements. Global warming is now large enough that we can scribe with a high degree of confidence a cause and effect relationship to the greenhouse affect. Computer simulations indicate that the greenhouse effect is already large enough to begin to effect the probability of extreme events such as summer heat waves. But it was another 13 ppm before the Kyoto Protocol was adopted by parties to the UNFCCC and 14 ppm more before it was finally ratified. 21 ppm later and it is a shadow of its former self, but at least with the legacy of some beginnings of a global carbon market. However, it is trading close to zero!! In the interim there was a valiant attempt at a new global deal, but even that was 12 ppm ago. Our goal to be avoided, 450 ppm, is now feeling a bit close for comfort, given we are already at 400 ppm and 300 ppm was only passed under the previous British monarch. Not to worry, it should only be another 15 ppm before a new global deal comes into force, although after more than 3ppm of discussion, the negotiations don’t really seem to have started. So we wait again, hopeful that someone has got a plan. But a lot can happen in 50 ppm if we try hard and we really want something!! After all, the first world wide web page was posted only 43 ppm ago! Anyone taking bets on when the global atmospheric CO2 concentration will peak? Let’s keep in mind: Europe’s efforts to control CO2 emissions, although noble, pale into insignificance against rising emissions elsewhere, driven by turbo-charged GDP growth in China, India, Brazil, etc. For all the talk, the spin, the greenwash, the regional carbon markets, the technology transfer mechanisms and innovative carbon financing initiatives, one thing is clear: none of this has yet worked at a global scale. Global emissions are on the rise. For these and other efforts to work, we need to get serious and scale up. The alternative is that we let this problem get so out of control that we need to view geoengineering as a serious option. I hope it doesn’t come to that. So let’s price this problem in a sensible, managed way and unleash the innovation that we know can get us to where we need to be. Then we get the jobs, the growth, the new industries and climate protection into the bargain. What’s the alternative? Bury our heads? Sing ‘la-la-la’ in the hope it all goes away? We have the technology, we have the money. What’s missing is the political will. Voters, NGOs and the private sector are looking to governments to lead. It’s high time they did. From a historical perspective the Earth is currently CO2 impoverished, it’s worth remembering that this CO2 is not new, but recycled. Over the Earth’s history, atmospheric CO2 concentrations have ranged from 180 ppm to over 6,000 ppm. Below 150 ppm, plant-life dies off on a massive scale. The Earth actually came very close to that point many times over the last 2 million years during the ice ages. At the bottom of the last ice age just 20,000 years ago, life on the planet literally teetered on the brink when CO2 fell to a level of just 180 ppm. No one disputes that man’s activities have helped to increase atmospheric CO2 concentration, and it should not be in dispute that plants and life on the planet are thankful that man has done so. At 400 ppm, the planet is a safer place to be and will be even safer at 800 ppm, as plant-life will be stimulated & crop yields will increase dramatically. It is likely to be cold and damp in Poland in mid-November, even in the absence of the “Gore Effect”. There are likely to still be three groups of nations at COP19: developed nations with advanced technology; developing nations which want that technology for free; and, not-yet-developing nations, which want the profits from the sale of the technologies the developing nations want for free. Not a promising basis for progress. There will also likely still be national politicians salivating over the prospects of carbon tax revenue; and, global politicians salivating over the prospects of that same carbon tax revenue. The prospect of a “cat fight” between national and global politicians over the same carbon tax revenue portends the possibility of some amusement at COP19. The global governance folks will likely never be happy, even if the “haves” ultimately have not and the “have-nots” ultimately have, since they would still have to “govern”. I find the concept of global governance by some sub-set of the tin-pot despots represented in the UN General Assembly strangely unappealing. I agree that the COP process seems to be more focussed on money transfer these days than it does on the hard job of mitigation. Such is the state of the world. Bad news for alarmists. In my office there is probably >1000 ppm of CO2 and I feel just fine. By the time the Earth reaches about 600ppm currently confirmed fossil fuel reserves will be burned and CO2 content in atmosphere will be about twice the average in Holocene. However, it is likely we won’t exceed Holocene warm periods. Is that from all the hot air you put out, Jiri? Such, at least, is the world of politicians, bureaucrats, what currently passes for “statesmen” and wannabe world rulers. David, try to be factual please. Sorry – couldn’t resist that one.